The cost of solar power has touched a new low—tariff reached Rs 3.15 per unit on April 11, surpassing the earlier lowest of Rs 3.30 per unit achieved in Rewa Solar Park (RSP) in February 2017. One main reason for the fall in solar tariffs is the falling price of solar modules, which have fallen around 30 percent during 2016-17; the other reason is the benchmark set by the RSP, which forced the developers to quote low. RSP through its unique project structuring has set new standards for other projects. The Ministry of New and Renewable Energy recently released a set of draft wind power guidelines to resolve some of industry’s issues, and provide a fair and secure system of payments. These guidelines are drawn from the RSP in Madhya Pradesh (M.P). The Centre has also written to all other states asking them to incorporate the features from this project in their policy, for keeping the cost of solar power low. So what makes the Rewa Solar Park a success? While RSP’s tariff average is not the lowest, it stands a close second, costing Rs 3.30 per unit. The park’s tariff for the first year of operation was Rs 2.97 per unit, the least ever in the country. The low tariff rate was achieved without using viability gap funding, a form of capital subsidy bridging between project costs as per the market and the developer’s quotation. The project—developed by Rewa Ultra Mega Solar Limited (RUMSL)—is a joint venture between Solar Energy Corporation of India and Madhya Pradesh Urja Vikas Nigam. It is the first project in the country to have electricity procurers from different categories, namely Delhi Metro Rail Corporation (DMRC) and Madhya Pradesh Power Management Corporation Ltd (MPPMCL). The two stakeholders signed a power purchase agreement (PPA) on April 17, 2017. In another first, the project received subsidies from Clean Technology Fund (CTF), an international fund for low carbon technologies. It offers three-tier payment security mechanism to developers: letter of credit, payment security fund and M.P state government guarantee. “There has been an optimum distribution of risk between the procurers, developers and RUMSL, leading to better tariff. Usually in most government contracting, including for procurement of solar power, contracts are structured such that the government bears minimum risk and all uncertainties are left to the supplier/developer, who loads the same on to the cost. For Rewa, the project structuring was done as per global standards,” said Manu Srivastava, managing director, Madhya Pradesh Urja Vikas Nigam Limited. The distribution companies or discoms have suffered huge losses in the past and do not have enough cash to make timely payments to the developer. To reduce financial risk for the suppliers as well as the intermediary power procurer, the project has set up a new payment mechanism. RUMSL provides letter of credit for one month’s payment, a payment security fund along with the MP state government guarantee for delay in payments by MPPMCL, the electricity procurer accounts for 78 per cent of power sold. A letter of credit is a document from a bank that guarantees payment. If MPPCL fails to pays the developer, the bank that issued a letter of credit has to pay instead. For the remaining 22 per cent of power, DMRC has to provide only for a Letter of Credit, the amount however is equivalent to 1.25 times the average two month’s billing. The erratic unavailability of evacuation infrastructure, curtailment and backing down instructions by state load dispatch centre results in higher risk for developers. To contain their losses, RUMSL compensates for grid unavailability beyond 50 hours (during generation hours between 6 AM to 6 PM) which can also be due to backing down instructions from Regional Load Dispatch Centre. Further, if DMRC and MPPMCL are not able to procure the power in line with guaranteed energy off-take, the developer is compensated for the shortfall in supply. Guaranteed energy off-take is the amount of electricity the procurer agrees to buy in a year. 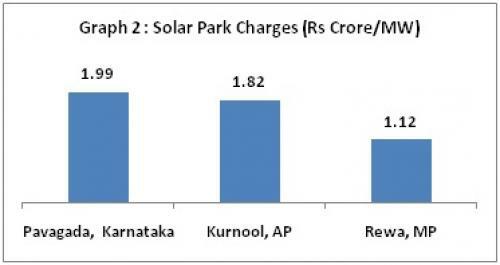 The cost of RSP was much lower than other such parks in the country. The project location was chosen such that the land-related charges were low. Further, grants from multiple sources helped bring down the park cost. Internal evacuation infrastructure was kept inexpensive using MNRE grant under the solar park scheme, and a World Bank loan, 25 per cent of which is a super-concessional loan from Clean Technology Fund, available at interest rate of 0.25 percent. Rewa is the only solar park in the country to avail loans from the World Bank and CTF. Developers fix tariff considering the prevailing tax scenario, but any change in tax rates or laws is difficult to foresee. The “change in law” clause covers the impact that any sudden change in fiscal and monetary policies might have in the tariff quoted at the time of bidding. For instance, the clause will allow adjusting to the changes made in Goods and Services Tax (GST) law. The rates of GST are not known, so depending upon their risk perception, developers at the time of bidding like to keep buffer between 60 paisa per unit to 75 paisa per unit in their quoted tariff. MNRE report on GST suggests an impact between 12-16 per cent on solar photovoltaic grid projects. RUMSL covers the impact of change in law on both project costs as well as revenue. With this arrangement, developers in RSP quoted low tariffs, keeping aside the buffer. Clarity on consequences of early termination of the contract is needed so developers and their financiers can protect their investments. Thus, in case of termination due to default by any entity, RUMSL provides an option for suitable termination compensation to the suffering entity, thus relieving it from the after-effects to the extent of a combination of debt due, equity investment insurance covers. Such a provision has been made in case of Rewa project for the first time in Indian renewable energy sector. The Rewa solar park’s arrangement benefits both developer and procurer, thus, creating a new benchmark for solar power projects in the country. Taking a cue from this, the government now wants to follow the RSP model for solar as well as wind tenders across the country. Check http://solarmyroof.cseindia.org/ for all the information. Great article. Thanks for sharing the helpful resource. Check with India’s leading solar energy solutions provider CleanMax Solar - https://cleanmaxsolar.com/ . They are expert rooftop solar solution provider and have many solar successful projects all over India.